The letter U does not have many words, at least not kid friendly words. That certainly makes it difficult to come up with a fun letter U activity! 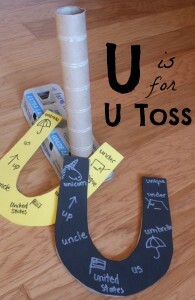 Difficult is not impossible though and I knew if I stuck with it eventually I would find the perfect Letter U game. Materials: Egg carton, paper towel roll, foam, cereal box and permanent marker. Set-up is simple. Cut a hole just big enough to fit the paper towel roll. This makes the base. Tips to Maximize Learning ~ 1. 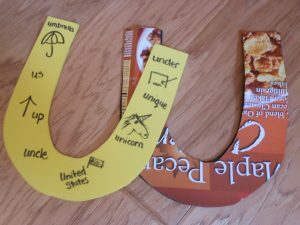 Try to use as many U words as you can think of while you play. 2. 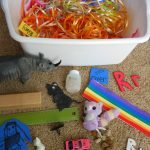 Encourage your little one to think of some as well! 3. Find other UNIQUE places the toss will work. Maybe the leg of a chair or the railing on the stairs. This is a part of the Letters Series. Great idea! Very cute and my preschooler loved it! Had to comment; I teach Kindergarten in a Title I school when I saw this game I knew I had to add it to my Alphabet Units. Except I HAD to change the name, for years I have watched my littles spell qcumbr, elufunt and horshu-so the name of the game is HorshU! Qut (cute) right? Thank you for all your nifty ideas. That is so cute Terri! Thanks for sharing.